HOW to MAKE a FLOWER POT BIRD BATH. . . . . . . . . .
You've seen them in magazines, on television and in books. Well, hunt no further, here are complete instructions for you to make your own Terra Cotta Flower Pot Bird Bath. Your best bet for decorating terra cotta that will be used outdoors is Patio Paints. I know they are a little pricey, but they are fade resistant, non-toxic and designed for outdoor use. Patio Paints also make a clear, non-toxic sealant that will protect your handiwork. Another option for protecting your work would be a water-based polyurethane. Read the instruction label and look for soap and water clean-up, and a product that is meant for use over painted surfaces. I don't recommend oil-based polyurethane for painted surfaces. It is yellowish in color and over time it will cause your work to have a yellow tinted appearance. Whatever you choose, remember it won't be permanent. Your bird bath will likely require refinishing and touching up every other year. After all, it will be outside in the elements! For the saucer of your bird bath, try to find a waterproof type that won't require any treatment inside the bowl, (where the water will go). For the outside, Patio Paints are again preferred. Patio Paint Clear Gloss Sealant or some other water based sealant for sealing the painted surfaces of your project. The instructions for Patio Paints and Plaid Durable Paints don't call for one. I have always used one in spite of this. A sealant helps protect against water damage. Ultimately, this is up to you. Oil based polyurethane for sealing the insides of the flower pots. Draw a line with a pencil, below the rims of the small and medium sized pot onto the pot below it. After you unstack the pots to paint them, this will help you define the area that will be exposed when the pots are stacked. You don't want your design to be hidden! The two larger pots on this bird bath are painted light green, the small pot is yellow, and the saucer is white with a blue scalloped design. 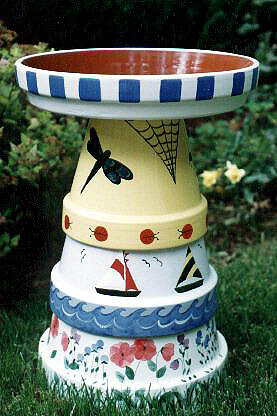 On this bird bath the large pot is painted light green, the medium pot is light blue, the small pot is yellow and the saucer is white with blue stripes. When you're finished decorating/painting your bird bath, let it dry thoroughly. Then seal the entire outside, (even the unpainted outside areas of the pots that won't show), with at least 3 coats of water based polyurethane. There are several of these on the market, available at craft, hardware and paint stores. Check to see if the product you select is OK to use over a painted surface. I stress water based polyurethane because oil based products have a yellow tint and will likely discolor your design. I recommend that you glue the saucer to the smallest pot. This will prevent critters from breaking it when they climb up for a drink of water! This is also safer if you have children. To glue the two pieces together, run a generous bead of Liquid Nails Construction Adhesive on the smallest pot where it will be attached to the saucer. Always hold both the saucer and smallest pot when handling them, even after they are glued together. Turn the saucer over on the floor and place the small pot in center of saucer bottom-let dry overnight. I don't feel it's necessary to glue the remaining pots together. It should be stable enough without doing this. Besides, if it's all glued together, how would you move it inside for winter storage? It would be nearly impossibly to lift! Glue the top two pieces together like this! Do not place your bird bath directly on the ground. It will last longer if you minimize contact with the ground and moisture. Set on treated lumber or a patio stone. Conceal the lumber or stone with pebbles or mulch if desired. Starting with the largest pot, carefully stack pots into position. If they don't fit together without wiggling, use self-adhesive foam weather stripping, (the kind you use around windows and doors), to fill in the gaps. Apply the weather stripping to the inside of the rim, (where it won't be seen), of the pot that's wiggling! The foam will help to fill in these gaps and stabilize the bird bath. Gently work the pots into place. Do not press down on the pots or saucer - they will crack! To clean, wash with warm water and a mild detergent. Dont use abrasive cleaners or scrubby pads. They will scratch the finish! Bring your bird bath inside to a warm, dry location for the winter months. 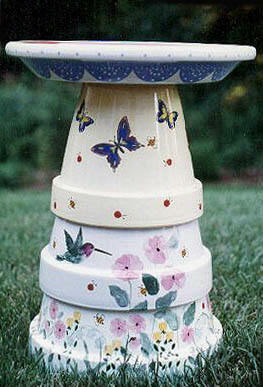 If you would like pattern ideas for your bird bath, here are few publications that I have used. They all feature flower pot designs which can be easily adapted for use on a bird bath. Some of the publications listed are older and quantities are limited. Search for these at Amazon to order. Outdoor Companion - Mary Engelbreit - This book is loaded with beautiful photos and ideas for outdoor projects, (including a bird bath). I hope this information makes your flower pot bird bath project a little easier. Good luck and have fun!